Last weekend I finally went to see The Curious Case of Benjamin Button and was pleasantly surprised to see a Native American cameo in the flick played by, gasp, an actual Native American. 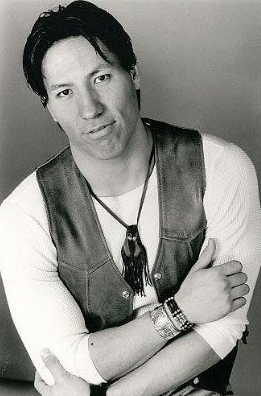 Myrton Running Wolf took the role of a Cherokee Navy Seal, who was on screen briefly and died before he got many lines in. Such a shame since Running Wolf is presumably immensely talented as he received a scholarship to attend the American Musical and Dramatic Academy in New York City where he studied classical and modern acting. His feature film debut was at the Sundance Film Festival in director Chris Eyre's 2002 film Skins. Nevertheless, I was happy to see a portrayal of a Native person on the big screen. Another film that ties Native peoples to the military is Reservation Soldiers, which is a heartfelt documentary that follows three young men into their participation with the Canadian army. Ultimately it shows how the military seduces young Native peoples away from their reservations. Perhaps Running Wolf's character would have learned a lesson or two from that documentary had not been before his time. -Repost by Lisa Charleyboy of Urban Native Girl Stuff. ~Reservation Soldiers will be shown at the 2009 Native American Film + Video Festival in New York City Sunday March 29th and can be purchased here. I almost rented Skins this weekend, saw it at my local video store. And a couple other Native American movies too. It give me something to look forward to. And I'm curious, what do you think about the whole Twilight franchise? It was probably the biggest movie of the year that had an Aboriginal lead (Gil Birmingham) or a lack thereof of one in the character of Jacob Black (Taylor Lautner). In the upcoming movie, New Moon, there supposed to be Native American werewolves. I wonder how many of them are going to be cast by actual Native American actors.